Since 1999, Direction has been committed to more effective leadership, more Diversity and Inclusion (D&I) in organizations. Through research, training, workshops, and coaching, we help organizations create successful and long-term diversity and inclusion. D&I within organizations can really make the difference. Diverse teams perform better than homogeneous teams, which ultimately leads to better financial and strategic results. That is not something we merely think; it has been proven in a worldwide research on the success factors of High Performance Organizations. Teams with more diversity and inclusion are more creative and innovative than homogeneous teams, which results in better diversity and inclusion problem solving, ultimately leading to better individual, team, and organizational performance. In addition, research shows that more diverse leadership in organizations encourages innovation and higher employee satisfaction. 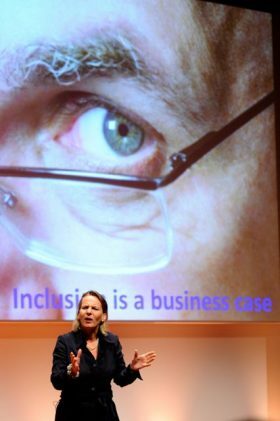 Despite the indisputable advantages of (gender) diversity and inclusion, none of the companies in the Dutch top have met the target figure of 30% women in the higher levels of authority in 2015. Not only in the business world, we are still a very long way from a balanced male/female ratio in the higher regions. In 2015, only 17% of all professors in Dutch universities were women. The proof is unmistakable; D&I have a strong positive effect on the (economic) success of the organization. Still, creating more diversity and inclusion is not easy. Proposal how you can ensure good rollout/transfer within the organization (to managers and employees). Think of ‘train the trainer’ programs, workshops, etc. Tips, insights, and inspiration to keep the organization’s D&I program up to date and on top of everybody’s mind. Thanks to the approach of our D&I experts, you are always certain of results. Please contact Esther Mollema for more information, 035 603 7979.